Our books are now on Goodreads and broken down by category. Check out our Goodreads page today! Want to check out a book? Just write your name, email address, and date on the sign out card located in the back of each book and place it in the checkout card holder. Books can be checked out for 30 days. If you’d like to make a book donation to the library or have any questions, email our Librarian, Peggy Gabriele by Clicking Here. Our free The Laurie Family Lending Library is dedicated in loving memory to our benefactor, Dorothy Virginia Garman Blankenship Laurie, and is a splendid way to keep current with spiritually centered ideas and practices. Every other week, we will feature one or two books focused on a daily practice that will support your spiritual journey. Each of our books features a teaching story from one of the world’s spiritual traditions — great nuggets of wisdom that you can use for speaking, teaching, and personal reflection. Learn what the greatest spiritual minds are thinking, understand new practices, and meet new spiritual teachers. Consider the Saint Miriam Library your guide to navigating through many resources to support your spiritual journey. Our Library is under the guidance of our volunteer Librarians and our bookshelves are arranged by spiritual topic for easy navigation! Please see anyone of staff during normal office hours or before or after any Mass or event! And, please be sure to donate your gently used or new books to our new library! 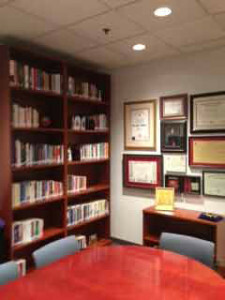 There are no fees associated with the use of our lending library. All books may be checked out for one, two, or three week time periods and renewed as needed. Please contact our Librarians to offer your new or slightly used books, or to gain access during off hours. Contact us here or call 215-836-9800.